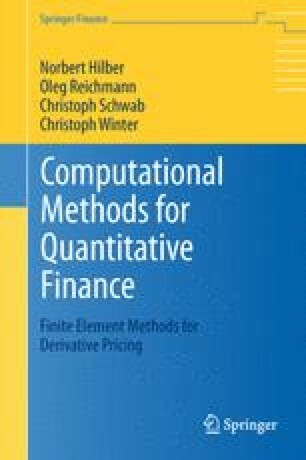 In the previous sections, we developed various algorithms for the efficient pricing of derivative contracts when the price of the underlying is a one-dimensional diffusion, a multidimensional diffusion, a general stochastic volatility or a one-dimensional Lévy process. In this part, we introduce variational numerical methods for pricing under yet more general processes with the aim of achieving linear complexity. Ch. Winter. Wavelet Galerkin schemes for option pricing in multidimensional Lévy models. PhD thesis, ETH Zürich, Dissertation No. 18221, 2009. http://e-collection.ethbib.ethz.ch/view/eth:41555.